At the tail end of a wonderful trip through Michigan’s Upper Peninsula, we stopped at a Ottawa National Forest Visitor Center. Because I believe my father (who was adopted) was of Native American descent, I gently tread the Indian past. 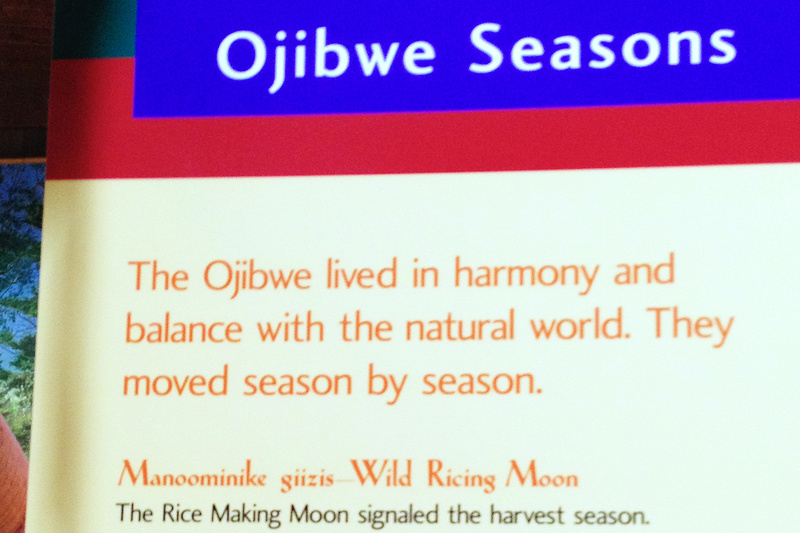 That said, moving backwards around an Ojibwe display, I nodded with respect while reading the history of the area, ending up at the beginning and the introductory sign: The Ojibwe lived in harmony and balance with the natural world. Reading the beginning of this sign felt like bear claws scraping down my spine. “Harmony and balance with the natural world?” I beg to disagree with this romanticizing of history. I would rather describe the native past as more of mere survival. To be sure, there was plenty more conflicts than this view offers. As the old threefold adage goes — man against nature; man against man; man against self. Starvation was an annual enemy. Ojibway camps would often split during the winter for better chance of survival, reuniting (hopefully) in the spring. Were they living in harmony and balance with the natural world when they couldn’t find even a beaver to eat, and lived (again, hopefully) off of tree bark and rationed dried berries? How harmonic are years of drought? Or when forest fires tore through the land, was this balance in the fact of new grass sprouting the following spring between blacked tree stumps with new people moving in a few years later? When native parties attacked other native villages long before the arrival of Europeans, was this living in harmony and balance with each other? And suicide among young Ojibway teens was not uncommon. Saying that native peoples used every part of everything they killed — meat for food, oil for hair or cooking, bones for tools, skin for clothing — is somewhat accurate. They could use every part of the animals and plants they survived off of. But how many heavy buffalo skulls would be dragged around from camp to camp after they chased dozens of bison off a cliff ? Yes, I realize I jumped tribes and location here, but hopefully you understand my point. Native peoples used the land for survival. After killing a deer, did they thank a deity or the animal itself for giving up its life so the humans could live? Yes, probably. The killing meant life. Did they give thanks every time? Every person? Probably not. I’m sure it would have depended upon the individual, just like today. My best guess is that human character and drive for living is the same throughout cultures, throughout time. There are the good and the bad, the thankful and the greedy, the kind and the arrogant. Each person, no matter what age or culture, chooses how to respond to situations. Yes, most of us today can live in harmony and balance with nature and each other, planting backyard gardens, sharing our harvest. If there aren’t suicide bombers or militants or drought or floods or oil or coal or gold seekers, etc, to disrupt. But individual character, along with natural and human disasters, have rather a way of shoving harmony and balance out of whack in any time and any place. Please, people, let’s not romanticize history or cultures, neither our own nor others’.